Banks are cutting down credit while consumers, hit by job loss or the fear of job loss, are paying down credit, not good news for policy makers who are trying to stimulate spending. Consumer credit has been contracting at a record pace this year including in June when credit contracted $10.3 billion. The contraction was split evenly between revolving, down $5.3 billion, and non-revolving, down $5.0 billion. Consumer credit contracted at an annual rate of $5.2 billion in the second quarter, more severe than the $3.6 billion rate of contraction of the first quarter. 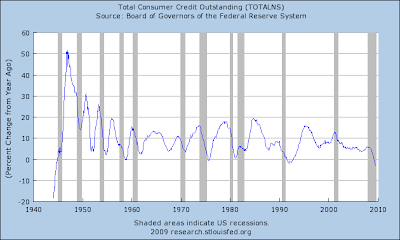 There's never much initial reaction to the consumer credit report, mostly because it's issued near the end of the day. 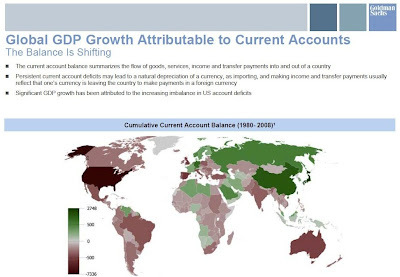 But this report is certain to appear in next week's commentaries, especially among the bears and realists. While a $10 billion contraction in credit may not seem like much compared to the multi-trillion plus mega numbers thrown around lately, it is, in fact, very significant as most modern recessions do not see ANY contraction in credit – maybe slower growth but almost never contraction. There are two types of dollars – real dollars and credit dollars. Credit dollars are made every single time you or any consumer takes out a loan or even uses your credit card to make purchases. Credit dollars are NOT REAL dollars. They are different in that they carry interest and must be paid back with REAL dollars earned through your productive efforts – the bank will NOT take back credit dollars in repayment of your loan (unless of course you take out a loan from another source). In the world of consumer credit, there are two types, revolving (mostly credit cards), and non-revolving (installment credit). 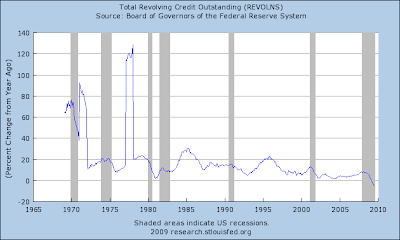 Revolving credit is a relatively modern innovation that has caused vast credit expansion that has been a part of the overarching credit bubble that led to higher corporate profits and thus higher stock market prices as well. Generally, in recessions revolving credit growth slows and then turns back up… the stock market then follows. That’s NOT what’s happening now. Consumer credit is continuing to fall at a faster pace while the stock market is zooming in a reflexive rally. 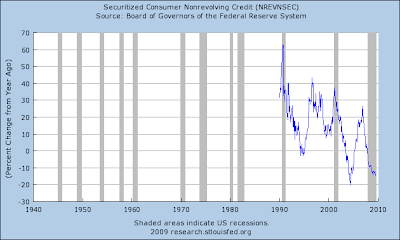 Note that the dip below the zero mark is the first since 1992, the only other time total consumer credit has been negative since 1940. Remember, the consumer is at least 70% of the economy. When they are no longer using credit – and this is just one aspect of their credit – then corporate earnings will suffer, and earnings are what ultimately underpin the price of stocks. Hmmm… 1990. 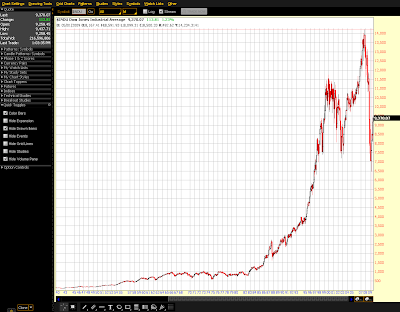 Let’s look at a non-logarithmic chart of the DOW Industrials. Notice anything starting to happen in the stock market about that time? 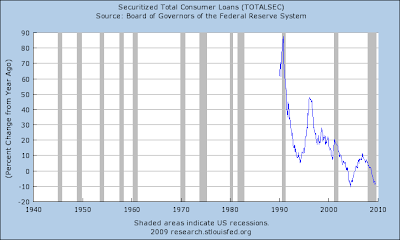 In my mind there is no doubt that the shadow banking system and the securitization of debt process led to the largest credit bubble in history. That bubble grew out of control, mostly unregulated and untracked. We are now paying the price and will be paying the price for generations as that mechanism was so successful at pulling future incomes into “today” that there is now simply no way that people’s earnings can pay back all the debt (Death by Numbers). This is just the beginning of the debt flush, it, quite unfortunately, will take years and years to get under control. 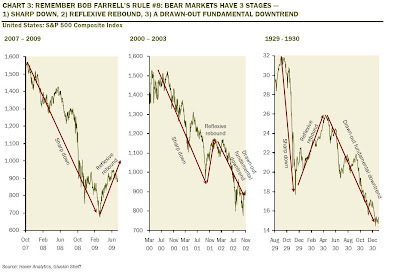 This is a terrific chart showing the “reflexive rebound” of the current bear market, the 2000 – 2003 bear, and the 1929 – 1930 market crash. 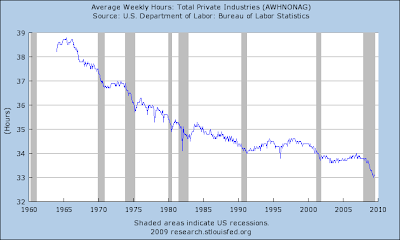 Put together by Haver Analytics, it clearly shows the A-B-C structure of major declines. This is NOT a typical recession, and it is NOT over (unless you consider CNBC to be your authoritative reference). “Proprietary and Confidential” yet all over the internet, if you haven’t seen their August “State of the Market” update, I will say that there is a lot of good data and charts inside – most of which has been covered on this site, but not all. Of course you have to wade through 99 pages of material, 20% of which is written by their legal department. They offer trading “suggestions…” and I know it’s tempting to just do the exact opposite of what they say, but they do seem to be almost as negative as me on the economy and present some pretty good data. Keep in mind that anytime you read something from Goldman, you should first; put on gloves, wash your monitor thoroughly, and if you print anything be sure to give your printer some TLC as it’s awfully traumatic to force such evil karma through the wiring and circuit boards. In fact, Google may want to hire a priest to exorcize their servers now. 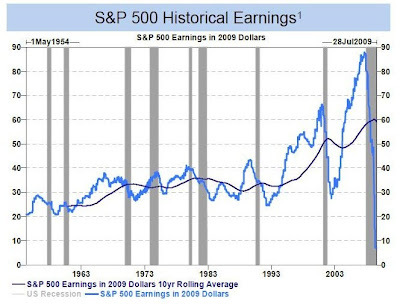 This is a chart that’s making the rounds in various forms, but GS sure made it pretty, so here it is – S&P earnings. Oh yeah, earnings are doing much better. Gee, that chart’s slope looks just like the slope of the stock market over the past six months… NOT. Stock prices are ultimately driven by earnings! Even those earnings are WAY OVER INFLATED due to the financial industry’s return to mark to fantasy and their HIDING of derivatives and off balance sheet DEBT. Thanks GS. While I don’t really believe in Hell, if there is such a place I’m sure most of you will be welcomed very WARMLY. Hey, at least they admit that CRE (commercial real estate) probably has a way to go on the downside. 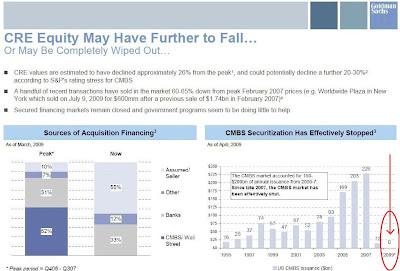 What caught my eye here is the Commercial Mortgage Backed Securities (the securitization of commercial mortgages) is effectively DEAD. GOOD! Evidently Peter Schiff is getting serious about his run for Senate. A run that I absolutely 100% support. Peter is a legitimate voice of reason. If we had a Senate full of people like him, this country would look a whole lot more like our founding fathers envisioned and whole lot less like the warped and demented vision emanating from the central bankers. He is on a mission to raise money, a mission that I supported by donating myself yesterday and encourage you to do likewise, no matter how much or how little. No matter how fruitless and frustrating our system is, it will not change unless we support people who can look beyond central banker manipulation. Help me raise $750,000 by the end of the weekend to demonstrate to Chris Dodd and other tax and spend politicians that we will not stand by idly. We will fight to take back America from a government that has gotten out of control. Go to http://www.schiffforsenate.com/! Donate anything you can and sign-up for Team Schiff to take back America! 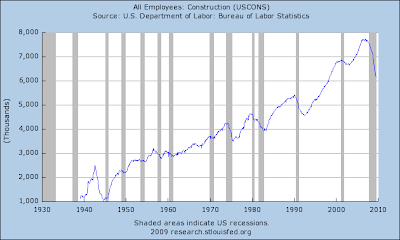 Corporate bailouts, “stimulus” programs and reckless spending are putting our economy in a deeper hole. You would think that out of 100 United States Senators, at least one of them would know something about finance and economics. However, that is clearly not the case. We must send Washington a message. You can help do that by joining Team Schiff to take back America at www.schiffforsenate.com. Washington needs to know that more government regulation, “stimulus” programs and corporate bailouts will only worsen our economy. The road to economic recovery lies with free market solutions from business and individuals – not the Federal Government. Join me at www.schiffforsenate.com. Let’s take back America together. Always sarcastically eloquent (love that), Kunstler focuses our attention once again on the Economic Mass Psychosis. We deal with and present a lot of numbers on this site, so I think Jim’s post is a great reminder to focus on reality behind the numbers – THAT DON’T WORK. Sure to offend almost everyone, I left off the last couple of paragraphs… please feel free to entertain yourself by following the link below, but only if you have tough skin! One of main reasons behind the vast confusion now reigning in the USA, our failure to construct a coherent consensus about what is happening to us (or what to do about it), is our foolish obsession with econometrics -- viewing the world solely through the "lens" of mathematical models. We think that just because we can measure things in numbers, we can make sense of them. For decades we measured the health of our economy (and therefore of our society) by the number of "housing starts" recorded month-to-month. For decades, this translated into the number of suburban tract houses being built in the asteroid belts of our towns and cities. When housing starts were up, the simple-minded declared that things were good; when down, bad. What this view failed to consider was that all these suburban houses added up to a living arrangement with no future. That's what we were so busy actually doing. Which is why I refer to this monumentally unwise investment as the greatest misallocation of resources in the history of the world. Even this interpretation -- severe as it is -- does not encompass the sheer damage done by the act itself, on-the-ground and to our social and cultural relations. Suburbia destroyed the magnificent American landscape as effectively as it destroyed the social development of children, the worth of public space, the quality of civic life, and each person's ability to really care about the place they called home. It's especially ironic that given our preoccupation with numbers, we have arrived at the point where numbers just can't be comprehended anymore. 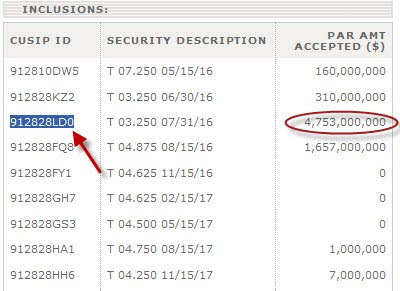 This week, outstanding world derivatives were declared to have reached the 1 quadrillion mark. Commentators lately -- e.g. NPR's "Planet Money" broadcast -- have struggled to explain to listeners exactly what a trillion is in images such as the number of dollar bills stacked up to the planet Venus or the number of seconds that add up to three ice ages plus two warmings. A quadrillion is just off the charts, out of this world, not really subject to reality-based interpretation. You might as well say "infinity." We have flown up our own collective numeric bung-hole. The number problems we face are now hopeless. 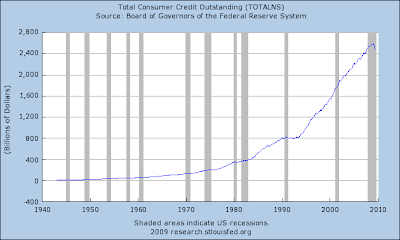 America will never be able to cover its current outstanding debt. We're effectively finished at all three levels: household, corporate, and government. Who, for instance, can really comprehend what to do about the number problems infesting Fannie Mae and the mortgages associated with her? There's really only one way out of this predicament: to get ready for a much lower standard of living and much different daily living arrangements. We can't wrap our minds around this, so the exercise du jour is to play games with numbers to persuade ourselves that we don't have to face reality. We're entertaining ourselves with shell games, musical chairs, Chinese fire drills, Ponzi schemes, and Polish blanket tricks (where, to make your blanket longer, you cut twelve inches off the top and sew it onto the bottom). Now that Newsweek Magazine -- along with the mendacious cretins at CNBC -- have declared the "recession" officially over, it's a sure thing that we are entering the zone of greatest danger. 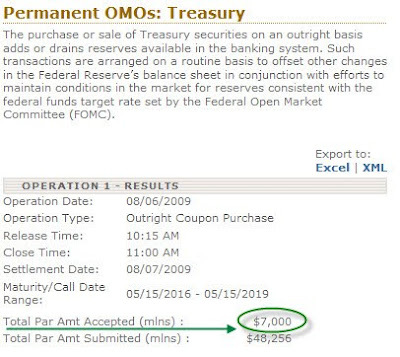 Some foul odor rides the late summer wind, as of a rough beast slouching toward the US Treasury. The stock markets have gathered in the critical mass of suckers needed to flush all remaining hope out of the system. The foreign holders of US promissory notes are sharpening their long knives in the humid darkness. The suburban householders are watching sharks swim in their driveways. The REIT executives are getting ready to gargle with Gillette blue blades. The Goldman Sachs bonus babies are trying to imagine the good life in Paraguay or the archepelego of Tristan da Cunha. Since a picture is worth one hundred million words from the BLS, I decided to let the Fed’s own charts once again do the talking. 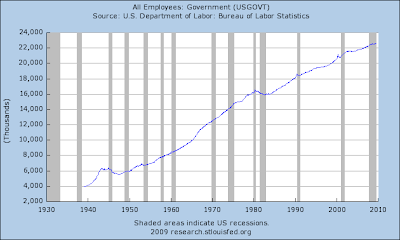 After reviewing the employment charts at the St. Louis Fed (Fred), that were updated just today, I have come to the conclusion that ultimately we are all going to wind up being government employees who do nothing but cut each other’s hair! Oh, and those who don’t do that will work in the “financial” industry. 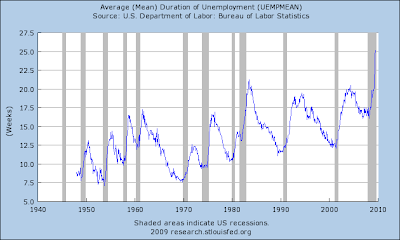 *Note: the little turn down in U6 (over 16%) is only there because of seasonal adjustments. Look at that chart. 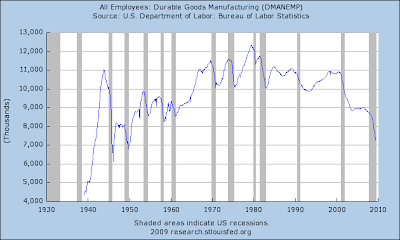 The United States TODAY employs FEWER people to manufacture Non Durable Goods than we did during WWII! 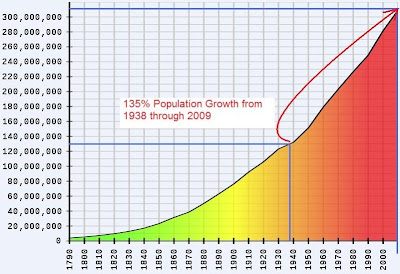 And that’s with a population that has grown from 130 million to over 306 million! 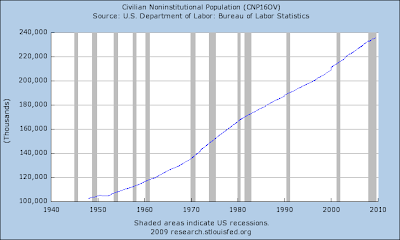 Or if you really want to compare the employment numbers with a figure, why not use the “Civilian Noninstitutional Population?” What’s that? In the United States, the civilian noninstitutional population refers to people 16 years of age and older residing in the 50 States and the District of Columbia who are not inmates of institutions (penal, mental facilities, homes for the aged), and who are not on active duty in the Armed Forces. 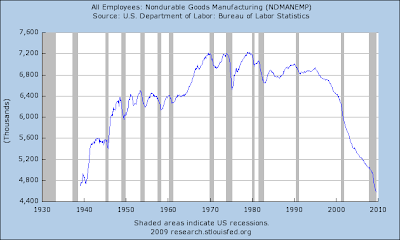 Of course Non Durable Goods Manufacturing would be things that aren’t built to last! Where on earth do you suppose you would go to build those? China of course! Sure, we are now a “service economy.” We don’t build things, we let others do that while we all cut each other’s hair, do manicures, “engineer” financial products (rob people), and blog for a living. It’s a terrific economy really, much better than Zimbabwe. After all, China’s still sending us their nondurable goods! Oh. Maybe not as much. I’m sure the geniuses at Goldman deserve that $700,000 average bonus for figuring out how to keep themselves employed while laying off the rest of working America which is exactly what has happened over the past 30 years. 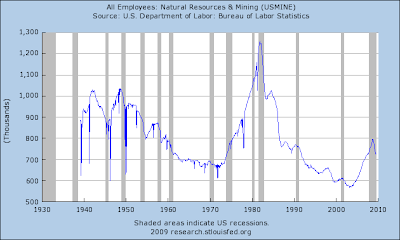 And since we don’t manufacture much of anything, we don’t need as many employees to mine stuff, either. Again, whatever we need we can get from overseas. Oops. Sorry. Don’t worry, just write if you’d like me to talk you through that short sale – it’ll only affect your credit for a year or three. It’s a good thing that governments, like the State of California, are so fiscally healthy, I mean just look at all the employment growth there! No slow down there! YET. But you can quote me on this, IT’S COMING. 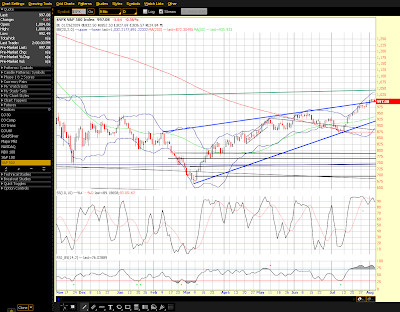 Look real hard, there’s a green shoot at the end of that chart too. No wonder stocks are priced at a P/E of 120+! The problem with this is that back in the '50s, '60s, and '70s most families only had one working person supporting the entire family. Today it takes at least 10 just to support the necessary 8 computers, 4.5 cars, 18 cell phones, and $4 a gallon gasoline. Not to mention all the other cheap nondurable goods made in China. 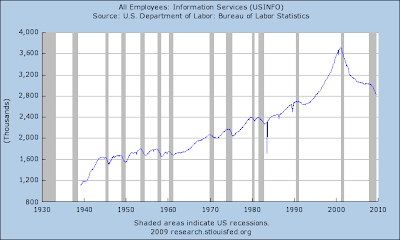 Yet, my point is that with that type of employment ratio we are back to the same raw numbers of workers as in the way back past. 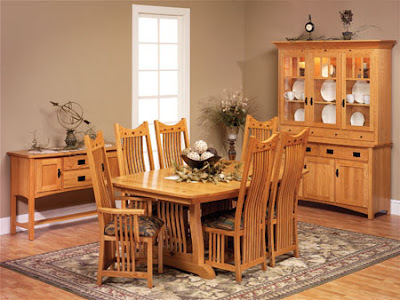 That means that for every household today that has two fully employed workers, there is at least one houshold with NONE. Anyone else see a rising trend there? 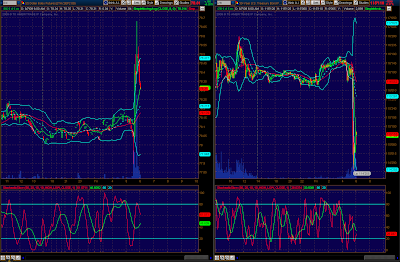 Maybe it's just me, obviously all the other market participants are seeing something vastly different. Don’t worry about those who are in danger of running out of benefits after exhausting their 79 weeks worth though. I understand that little Timmy Geithner is looking into extending those benefits even further... Of course the benefit to Timmy and the Bankers is that by giving 34 million Americans free food, and millions more pay for not working, is that they can still sit on the couch and watch the NFL which is coming back on television real soon! I believe that is method number 3,366 in the central banker playbook, “How to Placate an Entire Population so that they don’t Hang You from the Nearest Tree.” I hear it’s a best seller, and fortunately there are still plenty of employed financial engineers to keep the book sales up! And this is why someday soon we will all be government employees who do nothing but cut each other’s hair, “engineer” financial products, and blog. Damn, I knew I should have moved to New York and found a job on Wall Street. Oh boy, Don Henley is looking like he needs a haircut real soon! Better sharpen the scissors! SAN FRANCISCO (CN) - Small businesses that received $682 million in IOUs from the state say California expects them to pay taxes on the worthless scraps of paper, but refuses to accept its own IOUs to pay debts or taxes. The vendors' federal class action claims the state is trying to balance its budget on their backs. Lead plaintiff Nancy Baird filled her contract with California to provide embroidered polo shirts to a youth camp run by the National Guard, but never was paid the $27,000 she was owed. She says California "paid" her with an IOU that two banks refused to accept - yet she had to pay California sales tax on the so-called "sale" of the uniforms. The class consists mostly of small business owners, many of whom rely on income from government contracts to keep afloat. They say California has used them as "suckers" as it looks for a way to bankroll its operations while avoiding its own financial obligations. "Instead of seeking funds through proper channels, the State has created a nightmare," the class says. "Many of these businesses will not survive if they are required to wait until October 2009 to have these forced IOUs redeemed by the State." The class claims the state is violating the Fifth and Fourteenth Amendments. It demands that California be ordered to honor its own IOUs, plus interest. They are represented by William Audet. WASHINGTON (Reuters) - For the first time, more than 34 million Americans received food stamps, which help poor people buy groceries, government figures said on Thursday, a sign of the longest and one of the deepest recessions since the Great Depression. Enrollment surged by 2 percent to reach a record 34.4 million people, or one in nine Americans, in May, the latest month for which figures are available. It was the sixth month in a row that enrollment set a record. Every state recorded a gain in participation from April. Florida had the largest increase at 4.2 percent. Food stamp enrollment is highest during times of economic stress. 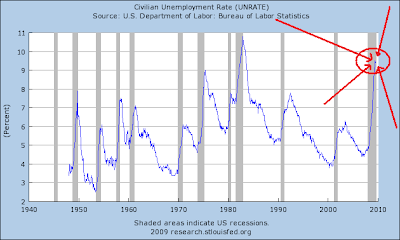 The U.S. unemployment rate of 9.5 percent is the highest in 26 years. Average benefit was $133.65 in May per person. The economic stimulus package enacted earlier this year included a temporary increase in food stamp benefits of $80 a month for a family of four. Notice the relentless climb in the numbers? Guess what… those numbers are not “seasonally adjusted.” There is no “birth/death” model used. It simply is what it is and it is shocking – 11.24% of the entire population. Please compare and contrast that reality with the bonuses on Wall Street or with the money printing games being played by the Fed, Treasury, and central banks. In Zimbabwe, they printed easy money too and the people starve as the cost of a loaf of bread becomes unaffordable. They have no food stamps in Zimbabwe, but for a while they had the best performing stock market in the world. For a while. 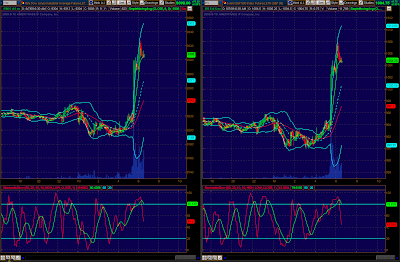 The dollar was up and bonds were down sharply on the release. In a nutshell, keep in mind that this current economic crisis has been going on for so long that there are now many people dropping off the back side of being counted. 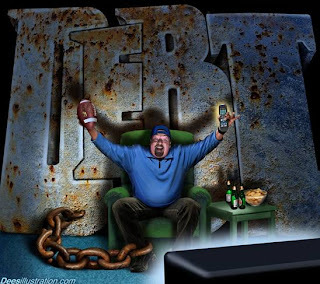 The consumer is still burdened with debt and more and more people are losing their incomes. 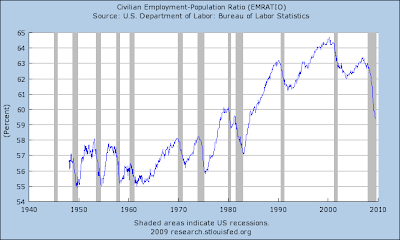 Talk of employment growth is simply premature. The higher stocks go without real earnings and without clearing the debts from consumers, the higher price to earnings ratios will go. It is ultimately earnings that underpin the equity markets and the price of stocks has NEVER been so high compared to earnings. It would take one heck of a lot of growth to pull P/E’s back into a normal historic range, and the only reason they look as “good” as they do is because the financial industry was allowed to go back and mark their assets to fantasy – otherwise the large banks are still insolvent and would not have earned a nickel. 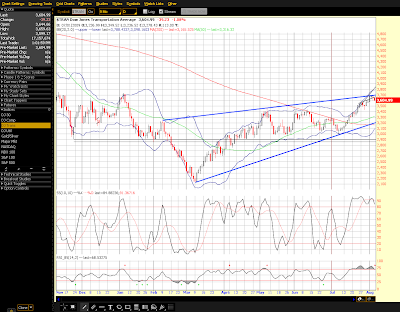 Then there’s the money printing/laundering game. If you haven’t read Monetizing Via Lies and Deceit… I suggest you do so. Job losses came in much lower than expected and point to being at or near the end of recession. Nonfarm payroll employment in July shrank 247,000, following a revised decline of 443,000 in June and a revised drop of 303,000 in May. The July drop in jobs was not as severe as the consensus forecast for a 300,000 decrease. June and May revisions were up a net 43,000. The easing in job losses was seen in both goods-producing and service-providing sectors. From the household survey, the civilian unemployment rate unexpectedly slipped to 9.4 percent from 9.5 percent in June and was below than the consensus projection for 9.7 percent. The decline was due to a sizeable drop in the labor force. Wage inflation returned more to normal in July as average hourly earnings rose 0.2 percent after no change June. The latest gain matched the consensus forecast for a 0.2 percent rise. The average workweek edged up to 33.1 hours from 33.0 hours in June. Today's report is very good news for equity markets. 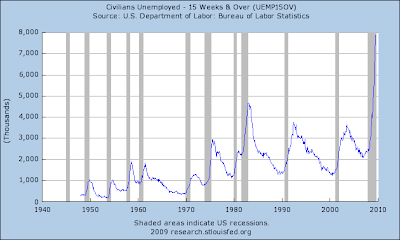 Job losses are getting smaller and the unemployment rate actually slipped. Without a doubt, the July numbers should be a big psychological boost for equities. Meanwhile, bond prices are down. 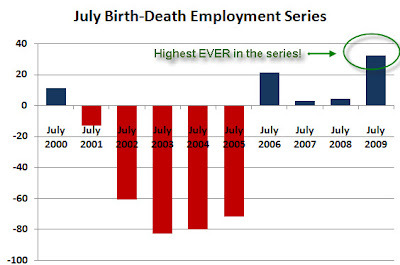 Here’s the report directly from the BLS (Bureau of Labor Statistics) - BLS July Employment Situation. Okay, now that we know we’re talking about massaged numbers that are derived from sampling and processed in a myriad of ways to arrive at a guess. And if that were done consistently, at least we could derive a trend, but that’s not the case either, especially over the long run. Areas in red are areas that lost jobs while the green are areas that gained jobs. What you’ll notice is that almost all the job gains are still in the government sector while all the losses are in the private sector. This is the trend and has been for quite some time. Of course it requires private sector money to pay for those in the government and you can see that our economy is getting stilted further and further out of balance with BIG government being the understatement of the century. The numbers presented to the public are the U3 numbers. You can see that it was only with seasonal adjustments that both the U3 and U6 rate improved and that without seasonal adjustments the rate was steady. 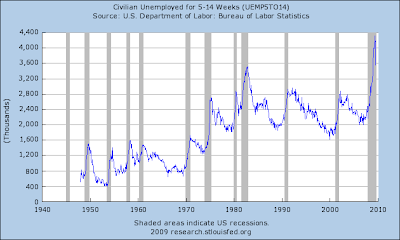 The numbers, as presented by the BLS, are trending to a slower rate of job loss. Again, the people who are not tracked, like part time employees who would work full time, those “discouraged workers” who have just given up. And then there are those who the BLS just creates out of thin air using their “birth/death” model (Mish does a good job of covering that aspect and I’m sure he’ll have the breakout later). So, has employment turned an actual corner or is it just a statistical blip combined with distortion? For me it’s too difficult to tell, the other more reliable data, like tax revenue and shipping numbers, do not support this report and thus we need to see if the trend of falling numbers can be maintained. From a technical perspective, probably the most bearish thing that could happen is that the markets spike this morning and then close down later today or even on Monday. Rallies often END on “Good” news, and we are now up against heavy resistance, extremely overbought, and McHugh’s wave count suggests we are finishing wave 1 up of c up. While I’ve been writing on the economy for a number of years, I did not start Economic Edge until the end of November of last year. My goal? 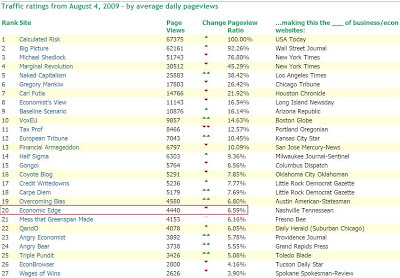 To reach 500 page views a day within a year. That was a well read economic blog and that was my goal. Today I average about 4,400 views per day, nearly nine times my goal! While still not a tremendous amount of viewers compared to the popular sites that have been around awhile, that’s a nice comfortable level that allows me to interact more with my readers. That's my personality, I'd rather share in a deep discussion with a few than a shallow one buried in a crowd. My newsletter and newspaper writing just never generated enough circulation to make it worth my time. The newspapers would gladly run rosy "buy, buy" articles but would simply not run any article that was even remotely negative on the economy – the deal breaker for me was when an editor changed my headline to the exact opposite meaning because he was not familiar with the terminology and did not consult with me first. Of course his terminology made the economy sound better than I intended and I’m sure that’s why he did it. I never wrote for a paper again and see clearly why their readership is dying. Those who do not tell the truth are destined for the dust bin of history. There are a lot of sites that do not qualify to be tracked, and there are a few that if on the list would push us back, sites like the Ticker Forum or Zero Hedge. That’s okay, breaking into the top 20 inside of a year is way beyond my expectations and it could not have happened without all the regulars who contribute their knowledge and put up with JS-Kit! Thanks for coming by and sticking with! 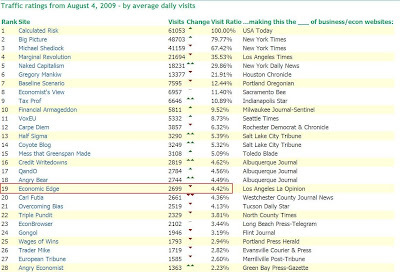 By the way, at the current rate of traffic, this site will have more than 1.6 million views in the next year! Looking forward to it, it’s going to be exciting, that’s for sure. Charles Biderman – One eyed man in the land of the blind! Blatent market pumpers square off with someone who looks beyond the headline BLS numbers. The same bozos who never saw the crisis coming still don’t know what’s happening. Biderman is exactly correct. I have news for all of them… The REAL LEADING INDICATOR is DEBT to INCOME. 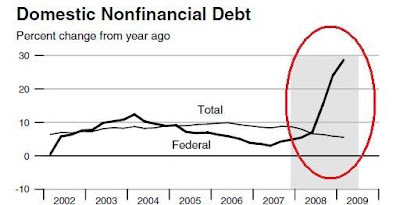 This ratio is getting FAR worse on all levels because the DEBT has not been cleared from the system and money printing does NOT eliminate debt when incomes are not going up – they are going down. 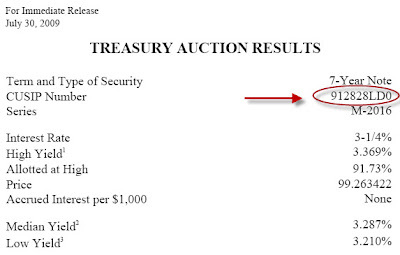 In regards to the TIPS comment by Biderman, again he is correct about the rampant, and now exposed, printing of the Fed and Treasury. Manipulated data and money printing do not a recovery make. Picking up perfectly on the REALITY so clearly pointed out in the last post, Max continues to simply tell the truth while others deny reality (ht Glass).